Being prepared when heading out hunting or fishing is something that should be taken seriously. I’m not talking about making sure you pack your favourite tackle or your fancy warming seat cushion. I’m talking about being prepared for when things go wrong. Unfortunately, some lessons are going to be learned the hard way and emergency situations can happen at any time with no warning. While you can’t always be prepared for everything, with some careful planning and consideration you can certainly be prepared for most. On an unseasonably warm November afternoon while hunting on Lake of the Woods, I was faced with just such an emergency, which thankfully ended safely but could have gone terribly wrong, very fast. We had a hunting party of three guys and we decided that on such a warm day our best approach might be to jump in the boat and push some islands. Unfortunately this plan didn’t pay off as the only thing we pushed out was a small doe. But the day may not have been a total loss as I learned a lesson I won’t soon forget. On our second push I was the shooter, so I dropped the other hunters on one end of the island and took the boat around the other end and pulled up on the adjacent island. There was a channel of water between the islands about 60 yards across. I pulled the boat up on shore wedged between a rock and a deadfall tree which hung out about 20 feet across the surface of the water. I walked up to a high spot on the point of the island and enjoyed some beautiful sunshine while waiting and hoping to see a nice trophy buck come strolling out of the bush to the waters edge. Unfortunately the push yielded no deer. But what I did see was the boat floating down the channel between the islands with nobody in it. I immediately jumped up, leaving my gear and rifle right where it was and ran as fast as I could through the bush, down the hill and to the edge of the water. I paused for a minute to consider where the boat would end up if I just let it drift, hoping it might make shore on either side of the channel. Unfortunately, the rather strong wind that day was intent on sending the boat straight down the channel and potentially leaving all three of us stranded on two separate islands. I was left with one option – strip down and swim for it in water which was barely above the freezing point. The worst part of all was that neither of the other hunters had emerged yet so there was nobody around if things went wrong. Fortunately, the boat was no more than about 30 feet from shore so I was able to swim to it rather easily, though not without several wild gasps which had become a uncontrollable reflex from the frigid water. My plan was to pull myself up into the boat once I had reached it and simply drive it back to shore. My body however had a slightly different plan. By the time I reached the boat, after only a few seconds in the water, my arms and legs had already decided that there was no way they were pulling me out of the water and into the boat. Now I was in trouble. I hung for a moment to try and catch my breath and then started swimming to shore with boat in tow. Thankfully, for a 19 foot boat with 100 horse four stroke, it came the direction I was swimming rather willingly. Though for the last half of the swim back to shore I began to question if I was going to make it and started thinking to myself that these are the stupid, seemingly overcomable situations that end up killing people. Thankfully after a few more kicks my feet touched bottom and I was able to make it to shore. Thanks to the warm weather which reached around 9°c, I immediately put my clothes back on and was instantly warm again and even managed to continue hunting the rest of the day. But that doesn’t mean the lesson was lost on me, and the remainder of the day was spent talking about how to be better prepared for similar situations in the future. This talk consisted of some of the steps we would take which are listed below. It’s easy to get caught up in the excitement of the activity for the day and become absent minded. It’s also common to want to rush to get to your spot and be ready and to make the most of the day. It was a combination of these things that lead me to be careless about how I beached the boat. The most important thing I can share with you is to slow down. Take your time, be methodical and pay attention to details. Having taken 2 minutes to grab a longer rope from my pack and tie the boat up would not have put my day out. In fact, in the end it would have saved me time and energy and possibly my life if things had gone any worse. When the ropes on the boat weren’t long enough to reach anything to tie off to, I made the mistake of thinking that pulling it up onto the rocks would suffice. However, a sudden shift in wind direction proved that theory wrong. We have resolved to put a longer bow rope on the boat so we can always tie off. Just remember when tying a bow rope, make sure it is not long enough to reach the prop on the motor if it drags in the water. When I reached the boat, my limbs had already stiffened up so much that I couldn’t pull myself up into it. Our boat is unfortunately void of a boarding ladder which would have made the difference so I recommend, if your boat doesn’t have one, get one. There are a number of rope varieties on the market that do not require permanent installation, but are easily deployable from the water. This can be a literal life saver so again, if you don’t have one, GET ONE. As I stated, it was fortunate that we had this unseasonably warm weather, but if you’re heading out into the wilderness (whether on the water or not) it is essential to carry something to warm yourself when needed. In short; when heading out into the wilderness, make sure you are always as prepared as possible. Make sure your vehicle, whether a boat, truck or atv, is properly equipped with all the necessary safety equipment and carry as much survival gear on you as you can. This situation was a literal cold hard reminder that being prepared can and will save your life. There are probably a hundred other lessons to be learned here (like hunting with a partner so you aren’t jumping into frigid waters alone) but I hope that by sharing this I can spare you from similar situations. If you have been in a survival situation, tell us about it. What happened, how did you survive and what lessons did you learn? With hunting season finally here, I thought I would share my pack essentials. This year’s bass tournament consisted a series of circumstances that taught us some unforgettable lessons. While our initial intent was to simple report on the outcome of our 3 days of tournament bass fishing, we think there’s a lot we learned that we can share. Those who know me will tell you that I am not a cautious eater. So when JoJo Cormier called me up to tell me about his new product, The Bushman’s Bar, I was more than willing to take a bite. Anyone who tells you that a 3 day bass fishing tournament is all fun and games… is a liar! An avid outdoorsman, I have been fishing all my life, but only started hunting a few years ago. I grew up in Ontario but now reside in the beautiful, big sky province of Manitoba. While I still do most of my fishing in Ontario (Lake of the Woods region), I hunt in the south-eastern parts of Manitoba. I am a husband and father of 4 children, and place a great amount of importance on teaching my kids to hunt and fish both safely and ethically. Wild Guide is a website about all things hunting, fishing and their related outdoor activities. Wild Guide contains helpful tips and information from fellow hunters and industry professionals, gear reviews, forums to connect with other outdoorsman and a directory of hunting and fishing guides, outfitters and camps across the country. We always love to hear from our viewers so please send us your stories and photos and we will post them on to our site. Have a question about something? Send us a message and we will do our best to get answers from the pros. Contact Us. Wild Guide is dedicated to promoting the hunting and fishing industry across Canada. Whether you are looking for information on your area, wanting to spread out and discover the opportunities of a new part of the country or if you’re planning a hunting or fishing trip here from outside Canada, you will find lots of helpful information here. Since hunting and fishing are such a huge part of my life, so is my dedication to bettering myself at both. My pursuit of knowledge has lead me to realize that, it’s not always easy to get the answers I am looking for. I wanted a place where I can find helpful tips and information as well as somewhere that I can connect with real people in the actual areas where I hunt and fish. From this, Wild Guide was born. I want to create a community where people new to the sports and seasoned veterans alike can connect with one another, share and learn from each other. I believe that safe, ethical hunting demands a constant pursuit of knowledge and learning, and my desire is for Wild Guide to be your safe and trusted source of this information. Collecting data from your trail cameras, measuring the results and using them to determine when and where to hunt can often be overwhelming. Wild Guide has discovered a powerful new tool to make this process a snap. W.I.S.E. is a computer software that takes the guess work out of the process and puts you on your prey. Organize your trail camera images by specific location. Import images from your games cameras or record your field observations. Works with ALL digital game cameras (works with any digital image). 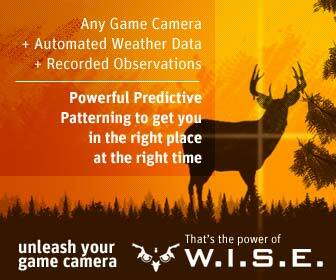 To download the W.I.S.E trail camera software and try it out for yourself, click here. White-tailed learning curves, those “learn by doing it wrong” moments that all hunters want to forget. But it’s important to remember and learn from them. The white-tailed deer. For 2 seasons, pursuit of this beautiful and gracefully elusive beast has left me empty handed and my freezer wanting. Such wanting is what has inspired this website, and surprisingly, what keeps me motivated to head back out each season to brave frigid temperatures in search of that trophy buck. While I have not yet had the honour of harvesting my first deer, the 2 seasons under wing have not been a total loss. The amount I have learned from my failures has given me more confidence than ever for the 2015 season. I strongly believe that it is important to learn through doing and often failing. I also believe that our experiences are not only invaluable to us but to others as well which is why I want to share mine here with you. So here is some of what I have learned so far by doing things the wrong way. Its late November, 20 below out, and we’ve just spotted a buck a few hundred yards up the trail heading off into the scrub brush. I decide to head off down the crossing trail to circle into the clearing behind the willow scrubs and attempt to gently push him back out to the trail for someone else in my party to take. It’s just common sense – move slow, quiet, mind your footing and keep your eyes open. This was my game plan and my silent stalking skills paid off, sort of. Once I had reached the far side of the brush patch I stepped up onto a stump to get a glance up and over the scrubs and hopefully catch a glimpse of some antlers. No such luck. That is until I stepped down off the stump where my foot found a piece of dead wood which was anything but quiet as I sank through it. As I said, my stalking skills are apparently good. I had crept up within 30 yards of my prey without either one of us knowing it. It wasn’t until I misplaced my foot that I saw the beautiful trophy 8 pointer as he burst from his hiding spot immediately to my right and jaunted off out of sight before an opportunity presented itself. As slow as I thought I was moving, excitement and impatience knowing what was in that brush caused me to be hasty. Had I moved even slower and taken the time to study the bush line harder before I’d got that close, I may have caught a glimpse of movement and had a shot. The other option, and what probably was the correct move, would have been to set up on the adjacent tree line and attempt to call him out. While I could spend time kicking myself for making the wrong decision, every wrong move I make is a lesson learned. I will not soon forget the sight of that white tail bouncing off out of sight. So now I’ve learned what not to do in that situation which has instilled confidence that I can be successful the next time I am faced with that scenario. Further, as this was a new hunting area for me, I learned a great deal about what is moving through the area and how and also scouted out a perfect tree stand spot for next seasons bow hunt. Ultimately, my mistakes and failures have left me confident that next season will be successful. While I recognize that this post doesn’t have any hard and fast tips for being successful in your hunt, I feel it’s really important to remind you not to be discouraged in those moments of failure, and to use them as learning moments for future hunts. Your helpful input is always welcome and encouraged here so please feel free to post relevant tips or questions in the comment section below. We would also love to hear your stories of failure or success so please email them to us. Happy hunting, be safe, ethical and environmentally conscientious.